The one(s) who nominated me for the Sheenazing Blogger Awards. You rock. Thank you. I really feel weird about self-promotion but if you'd like to vote for Better Than Eden, you can click this link. Would you consider doing that? When Bonnie mentioned that I had been nominated, I just assumed it was in the Underappreciated category (i.e. for the small blogs) but turns out I'm in the Best Looking Blog AND the Best Lifestyle Blog categories. I'm blushing. And while I very much appreciate the recognition, I think what makes me most want this award is the privilege of being able to display that awesome graphic on my sidebar. I've got the great Fulton Sheen as part of my header. That should count for something. Right? (You have to vote in each category so if you're not familiar with the names and need a recommendation, let me know and I'll give you a suggestion or two :) Oh, and you can only vote once! Thank you and happy Tuesday! Oooo! Congrats, Mary! I didn't notice Better Than Eden on there (probably because I was so overcome to be nominated myself!) Best of luck. I love the look of your blog, it's so refreshing and uncluttered. Oh my goodness. That was so nice of you to say! Thank you! I feel so weird doing this!! Congrats! my feed today is covered in Sheenazing Awards! - if you need an "underappreciated blog" vote for consider mine! I know! There's so many great blogging people out there. I feel kinda out of my league! ooh, that was fun!! I voted for you twice and felt great about it. I felt bad about the fact that it looks like there are a bazillion great blogs out there and i just. don't. have. the. time. 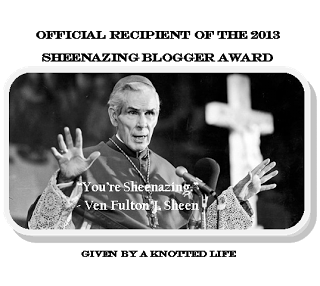 and ps - I love Fulton Sheen! I was thrilled to see you on there and also bummed you weren't in other categories! You definitely got my vote!